I read conflicting info about camping in the Tanami Desert. Your site seems to be better balanced and sensible. Our family will be driving across the Tanami in July. I already did the Tanami Track years and years ago with school, so the drive doesn't bother me, neither does bush camping. But some of the 4wd sites say that you really need to camp at grounds because of the Aboriginals - the wayward ones I suppose - and animals... They say to avoid waterholes. Sensible I suppose. My question is, is there anywhere that you can't camp and how do you find this out? Is there anywhere that you wouldn't recommend or alternatively would suggest for the stopover night? Also, do you know of a good bush camping guide for NT and WA? We have one for Victoria but I haven't been able to find one for up north and I'm sure there is one. Thanks! I like to think of myself as balanced and sensible, too :-). Most people are (needlessly) concerned about driving when it comes to the Tanami Desert. Concerns about camping are new to me. I never heard any warnings regarding camping, never heard of any bad experiences. It sounds weird to me, and a bit paranoid. I crossed the Tanami in May 2007, bush camping two nights on the way, and met only lovely people at the Aboriginal communities we visited (at the Alice Springs end) and on the road. If you plan to take two days for the crossing you'll likely camp somewhere about half way, I imagine. The Aboriginal communities are located more towards both ends of the track, so you would camp well away from them (in case you are still concerned). I'd probably avoid camping near Balgo, but that's not near the main road anyway. The way I see it you should avoid waterholes because you may disturb animals. It's not dangerous for you, it's dangerous for the animals. They need access to water or they die, and if your smell hangs around there it might keep them away. If you prefer a campground I recommend Rabbit Flat. It's a lovely place, has nice owners, and is about half way. Despite what most info says they are open 7 days a week. (New as of this year, 2007). Camping Guide? Absolutely. You can't go past Jan Holland's camping guide books. I own both, the Northern Territory and the North of Western Australia guide, and I can't recommend them enough. The best investment you'll make for the whole trip. It's like knowing one of the locals and getting all the local tips wherever you go. Very informative. I intend to drive in April with a Caravan and Landcruiser. Hope this is ok. Your Rabbits Flat stop is helpful as it's half way. Thanks, glad you find it helpful. Impossible to predict what you'll find in April. The southern end is usually fine that time of the year, but Sturt Creek could well still be too deep and there are other sections where the road stays wet and boggy for quite some time after rain. You'll have to wait what the wet season brings. Keep an eye on the forecasts as time gets closer and play it by ear. We were worried about heading out along the Tanami but now we are looking forward to it. Our trip will be in June from Melbourne, thinking about doing some prospecting along the way. Where can you get permits when you want to go for a short trip of the Tanami Road? And what are the cost? That depends what you mean by short drive and which permit areas you want to visit. "You don't need a permit, as long as you don't leave the main track and only drive into communities to buy fuel or supplies." Love the website, it has provided me with many hours (sometimes repeated) of reading providing me with great images and dreams. I plan to travel from Lake MacQuarie (NSW) to Broome for my 40th (June 2011) and plan to cross the Tanami. Having read your website and the comments that Rabbit Flat is closing New Years Eve and reading a recent news article that Yeundumu has had riots, my question or concern is there enough diesel stops to make my way across this region (Patrol 127litre fuel tank). I plan to either upgrade my subtank to 80 litres. Is someone taking over Rabbit Flat Roadhouse? Is Yuendumu safe enough to enter come June 2011? "Riots"... I wouldn't call it riots. There was some unrest, and if people would understand Aboriginal culture they would not have been surprised by that. The news of course did their usual shallow, sensationalist reporting on it. Yuendumu is a good place. I did not list Yuendumu as a reliable supply point anyway. The opening times of the stores are too variable. The only two reliable places have always been Rabbit Flat and Tilmouth Well, both open seven days a week. And unfortunately Rabbit Flat will indeed close for good by the end of the year. I would make sure I've got enough fuel on board to get from Tilmouth Well to Halls Creek, just in case. Update: as of 2011 Rabbit Flat is closed! We intend to drive the track early July with a caravan and Landcruised. This is our first long track with the caravan, and we are looking forward to it. Do you think there will be any problems? Would appreciate any tips. I love your website. My only suggestion would be that posts should be auto dated. I travelled the Tanami in July 2012 driving a Nissan Navarra 3 liter turbo diesel with standard fuel tank, towing a small off road van, I carried two 20 liter jerry cans and I topped up at Tilmouth Wells. I did the trip with about one quarter of a tank to spare after topping up the tank from the jerry cans. Hope this is of some help. We are about to travel the Tanami dessert in October. Are there any concerns about travelling at this time of year? As I have noticed everyone seems to travel this track in June/July. The comments on this page about avoiding "The Aboriginals" is racist and offensive. I live in the Tanamai and safety regarding camping is not an issue. Please remember you are crossing Aboriginal land and be respectful of this. Find out where it is ok to travel to. If you pass through an aboriginal community ask a local aboriginal person where it is ok for you to go to and camp. If you are scared of the "wayward Aboriginals" this is not the place for you. I read with interest some of the comments here. I worked in the Aboriginal Industry and Balgo in particular, so I ave traveled the track perhaps 60 or 70 times, so I thought I might add in some comments from my own experiences. You need bulk water and at least 2 spares and decent communication (a CB is useless). The first half on the NT side is usually fairly easy going and its a MUST to stop at Tilmouth Well and ask about the road to Halls Creek and perhaps a game of pool or two. If you're going to stock up on anything do so here. Rabbit Flat "Roadhouse" is a bit far fetched but it's open several days a week or maybe by now even 5 or 6 days. Be aware that in the wetter months, November to say March the track will be impassable for weeks at a time from Balgo to Bilaluna. In saying that, if you have something like a Mitsubishi Canter or Oka, it's not an issue. I have travelled the road in flood in a Canter with water up to the bottom of the windows, with no issues, as the road is well packed, however, in some places it can wash out and there is no help anywhere along the road. The only major crossing is the crossing near Bilaluna which at times can be several metes deep. On a final note, I notice the very politically correct comments about Aboriginal Communities. Most of the time they are safe enough to visit, however, Thursdays and Fridays are not good days because irrespective of the politically correct "dry communities" thing, this is crap, the Police do what they can to stop it but the violence when it gets into a community is breathtaking. And on a final, no doubt controversial note, I would also highly recommend women travelling without men (yep, I know, misogynistic etc.) DO NOT VISIT THE COMMUNITIES. When violence breaks out it is unbelieveable and hardly ever reported anyway. If you have an accident with a vehicle with Aboriginals in it and one of them dies, they will kill you if you stop, go to the nearest Police Station and report it, DO NOT STOP. Thanks for your insightful comments, Pete. Behind Mt Doreen is a good spot away from the road and interesting old buildings. We are planning a trip from Perth to Broome in a 4 berth campervan and then was thinking of heading either up to Darwin or inland to Alice Springs (don't have enough time to do both). We plan to travel in July/August next year. Can anyone tell me please if you are able to take a campervan on the Tanami Track or if you can, is it wise to do so? Any comments would be appreciated. Thanks. we are currently planning our Kimberley Adventure for next year. 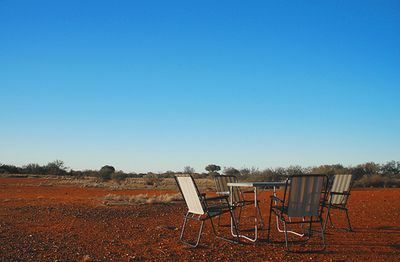 Just looking for clarification, is the roadhouse at Rabbit Flat still open and can we camp here on our way across the Tanami Track? Please do see Destination Kimberley. It answers all your questions about your upcoming trip, even questions you didn't know you had. Rabbit Flat closed years ago. We were about to embark on a trip along the Tanami trek. We are wondering if the roadhouse at Rabbit Flat is open. Have had conflicting information so just checking. Is the Tanami Track fenced? Would appreciate comments as to whether the Tanami Track from Alice towards Broome is fenced please? How wide is the shoulder? I'm hoping for a good 10 metres clearance off to the side of the road to get clear of the road trains and 4WDers.